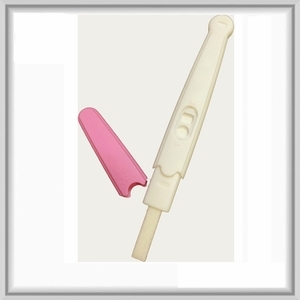 Bring the test strip and urine to room temperature (15-30C or 59-86F) for testing. If you prefer, you can urinate into a clean dry container then dip only the Fiber Tip of the Test into the urine for 10-15 seconds. While holding fiber tip downward, immediately replace the cap and lay the Test on a flat surface with the Test and Reference Window facing upward while you wait for the test result. DO NOT move the test while the results are developing. Read the result in 3 minutes. If no result appears, wait one minute longer. Do not read the results after 10 minutes. LH Surge: If two lines are visible and the Test Line is the same as or darker than the Reference Line, you have detected your LH surge and you will probably ovulate in the next 24-36 hours. No LH Surge: If two lines are visible, but the Test Line is lighter than the Reference Line, or if there is no Test Line, you have not detected your LH surge and should continue with daily testing. INVALID: If no line appears in the Reference Line Area, the result is invalid. Insufficient specimen volume or incorrect test performance are the most likely reasons for an invalid result. Review the procedure and repeat with a new test. You may do this test at any time of the day, but you should test at approximately the same time each day. Reduce your liquid intake for 2 hours before testing. To decide when to begin testing, determine the length of your normal menstrual cycle. The length of your cycle is from the beginning of one period to the beginning of the next (count the first day of bleeding or spotting as day 1). If your cycle length is irregular, that is, if it varies by more than a few days each month, take the average number of days for the last 3 months. Use the chart to work out the day you should begin testing. The day you begin testing is listed opposite the number of days in your normal cycle.